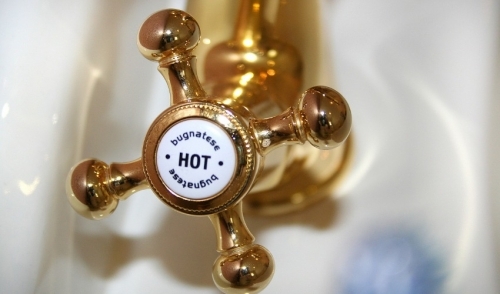 Few household appliances are depended on more and thought about less than the hot water heater. For many homeowners, installing or replacing the hot water heater is the only time this essential appliance enters their minds. The fact is, a little routine maintenance can not only prolong the life of your water heater, but ensure that is will run at peak efficiency during its long life. The pressure relief valve is a common part among both gas and electric heaters. Its job is to open and relieve pressure if there is too much building up within the tank. At least annually, gently pull the trip lever on the valve to ensure it is operational. Be sure to place a bucket under the valve to catch water. If it is working properly, you should hear a rush of air and see a small amount of water flow out. When you let go, the valve should close and the flow should slop. If it won’t open up at all – or won’t close, the tank will need to be drained and the valve replaced. To prevent scalding, keep the temperature below 120°F. Also, if you are going away, adjust the thermostat to the “vacation mode” setting. Why keep the water hot if nobody’s home? Turn off your heater at the breaker panel (for electric) or switch to pilot (for gas). Attach a hose to the drain valve, located at the bottom of the heater. Place the other end of the hose outdoors, preferably in a location that won’t be harmed by the hot water. Open a hot water valve at your tub or sink, and then open the drain valve. Let the tank drain completely. You should see sediment come out of the hose as the tank empties. To flush out the last of the sediment, open the cold supply valve a couple times to stir up and flush out the rest. Close the drain valve and let your tank refill. As the tank is refilling, head back to the tub or faucet you left open and turn it off once water flows out evenly. Only turn power/flame back on once the tank is full. Electric heaters can be damaged if the elements are not submerged in water when turned on. If your tank is an older unit, you may additionally benefit by installing an insulated jacket to conserve energy. Follow the instructions carefully and be sure not contact the exhaust flu. Thinking about your hot water heater now may be all it takes to avoid a cold reminder in January, with a head full of shampoo. If you have any questions about your hot water heater or any other major appliance in your home, feel free to call or stop in and our knowledgeable staff will be happy to help.